Are you in need of some top-quality turf to make your garden fresh and luscious? Well, look no further than Abbey Turf. We are a turf and soil supplier Ringwood residents can rely on for the best products. Our turf is fresh to order, so if you would like to arrange a delivery, get in touch today by calling us on 02380 812302. If you want your garden to catch the eye with only the finest turf and soil, then Abbey Turf should be your first point of call. We stand out above our competitors because we are a turf and soil supplier in Ringwood that does not use netting. Everything that we produce is in-house and we offer varieties of turf. For our domestic customers, we can cut fresh turf that will make your lawn look vibrant and healthy. As a first-class turf and soil supplier, Ringwood customers, we provide our services throughout the year. So, come rain or shine, our team at Abbey Turf are available to answer your call. You will struggle to find another supplier that matches the quality that we produce. All of our turf is grown across our 180-acre site. We can guarantee that you will not be purchasing second-hand products. We are a Ringwood turf and soil supplier that does not buy from anyone else. When you purchase with us, know that every roll of turf is 1 square metre in size. If you are uncertain about how much you need, then a helpful member of our team will advise. As well as providing excellent fresh-to-order turf, we also supply top soil. You will want to purchase one of our maxi bags of soil for garden borders, seeding and turf laying. 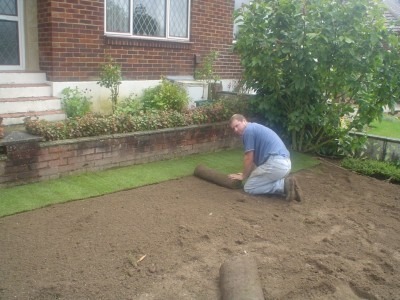 We carry out an expert screening method to ensure that there are no weeds or sharp objects hidden in the top soil. You will struggle to find another turf and soil supplier in Ringwood that pays as much attention to detail as us. What More Can We Do For You? We pride ourselves on being a turf and soil supplier Ringwood customers can rely on for a quality service. Among our list of products, we also sell bark chippings per cubic metre. As well as boosting the look of garden borders, they also prevent weeds from sprouting. Whenever it comes to any sort of home improvement, whether that be to the interior or exterior of your home, you need to turn to a company you can trust. At Abbey Turf, we have 25 years of experience and our family-run business has grown significantly. We are a turf and soil supplier in Ringwood that prides itself on quality products and first-class service. When Abbey Turf was founded we had 10 acres, and today we have a huge 180-acre site to grow the best turf for our customers. If you are not an expert when it comes to gardening, then don’t worry. We are a turf and soil supplier, Ringwood customers, that is brimming with advice. We can inform you of the different types of lawn turf and how best to boost your garden. Our weed-free turf is inspected daily to ensure that you receive the best. Also, we provide flexible delivery times. Once the turf is harvested, we will aim to send it to you within 24 hours. The products will be delivered by a fork truck and will generally arrive in the morning or afternoon. Our turf and soil supplier, Ringwood customers, can arrange a time that suits you. If you need fresh to order turf or top soil, then look no further than Abbey Turf, a top-quality turf and soil supplier. Ringwood-based residents will receive exactly what they are looking for at a fair price. We are proud of our excellent services, so give us a call today on 02380 812302.